I didn’t consider myself to be able to inspire obedience in my son but this weekend it became apparent that he does actually listen to me. I’ve been working on the spare room at a ‘dadderly’ pace, shall we say. This has involved me ripping up a carpet and sanding some floorboards using a sander completely ill suited to the job. It was suggested to me on more than one occasion that perhaps I should rent a proper floor sander but I continued with ruthless bloody mindedness because I’d already bought the sander and there was no way I wasn't going to finish the job with it! Besides, I had ancient Chinese proverbs and other annoying motivational quotes I'd seen on LinkedIn, tormenting me and spurring me on. "Impossible is nothing," I muttered through gritted teeth. ...But none of these are feasible explanations for why you can’t work at the pace of a team of a fifty thousand Egyptian slaves hauling stone up a pyramid. The toddler, on the other hand, looks at the sander with awe. It might as well be the mummified remains of Tutankhamun! If I told him I needed to sand the boards every day for the next year he'd nod his head sagely in total agreement with me. If only my wife had the same understanding of the dirty processes than poor dads like me have to go through to achieve perfection for a kid's bedroom! Anyway, the point of this story is that over the last few weeks months days I’ve had to tell him on a number of occasions not to go in the room because of paint drying and a load of other catastrophes waiting to happen with a curious toddler. He respects my opinion on things. He feels like I'm a leader and he likes to follow my ideas. I'm old. This really made me feel like a cantankerous old man who tuts and tells kids not to steal his apples. That doesn't feel like me, but apparently it is now. I'm officially old. 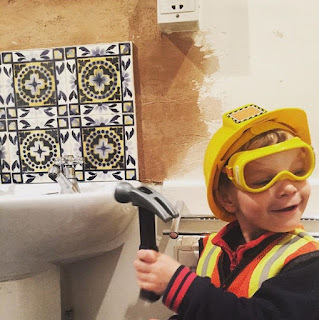 Whenever we do DIY together he wears his builder outfit. Finally, here’s a quick pro tip: Include your children in DIY wherever possible! He’s helped me paint the boards, and even helped me assemble his big boy bed. He took a lot of pleasure in dripping glue into holes and hammering pegs in, and this gave him a real sense of ownership about the bed so the cot transition was painless. And now, when he moves into his new bedroom, he'll hopefully always remember how he painted some of the floorboards.